Our studded leather harness is a must for any Soldier in battle. It is crafted from top quality 8-9 oz. leather, making it perfect for any LARP event, Theater production, or a Ren Fair. This armour features a full back plate. There are four straps and buckles in the front for closure, and the sides lace up, making this piece extremely adjustable in size. 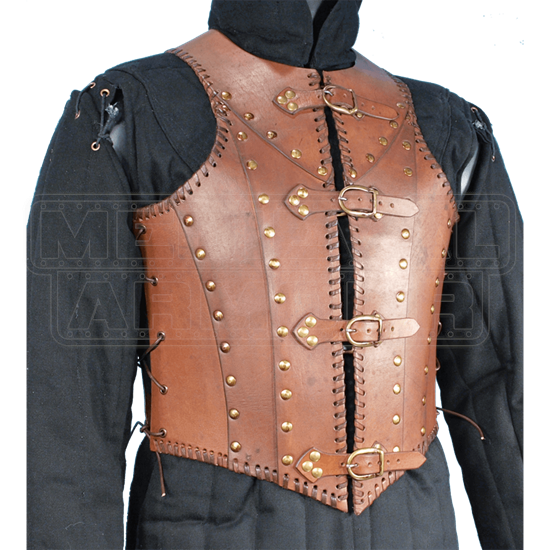 Wear this leather armor over a gambeson or chainmail for ultimate protection in battle. When out of battle, the armour is comfortable enough to double as a leather vest over a period shirt. The armour has detailed lacing along all the edges and stylish studding as an accent, giving it a very nice look. The sides lace up and will allow for larger sizes. Length from Shoulder to Waist: 21.5 Inches. If you have smaller measurements than the minimum measurements given, you may want to wear a gambeson or padded shirt under the armour for a better fit. I am very pleased with this item. I have worn it over a gambeson and chainmail with gorget and pauldrons, and again just over a medieval clothing with bracers greaves and cape. In all cases I have recieved very positive feedback as to looks, and the comfort of wearing it is top notch. Highly recommended, and very affordable.